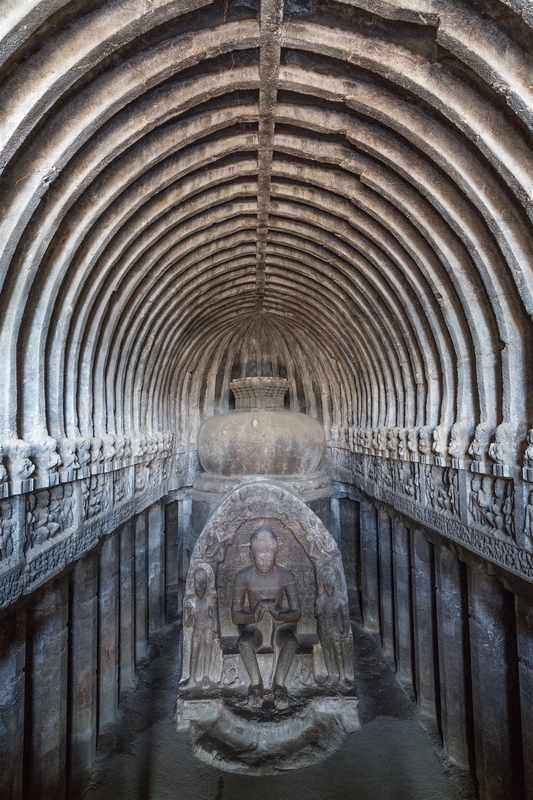 Ellora Caves are 18 miles North-West of Aurandabad, so unlike Ajanta caves you won’t have such an early start in order to get there for opening time. I would recommend getting there early to once again try to avoid the hoards of tourists and school parties. 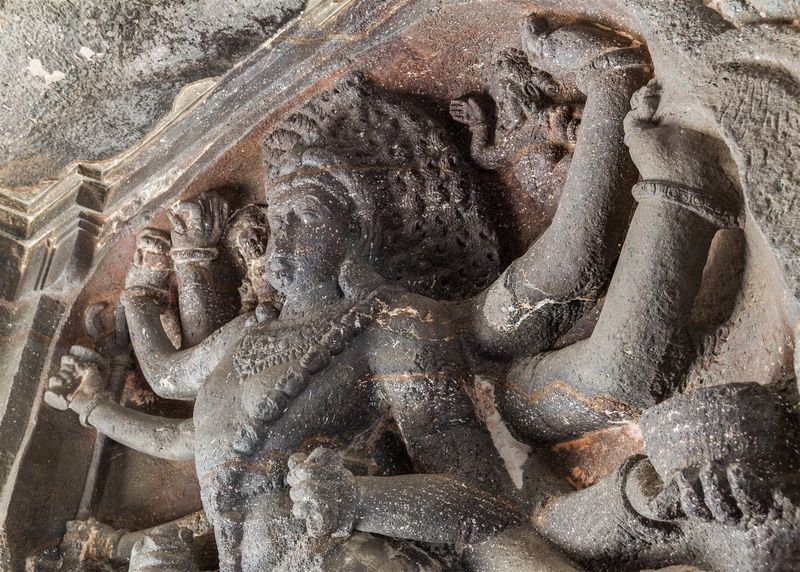 Ellora represents the peak of rock-cut Indian architecture; to a degree you can draw similarities with the nearby Ajanta Caves, but where Ellora lacks with the absence of delicately painted murals, it gains by the sheer complexity and scale of what the “builders” achieved here. 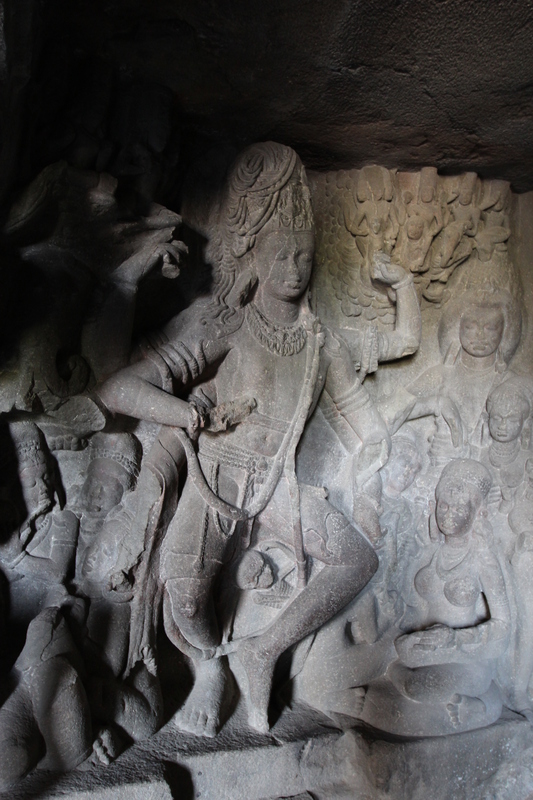 There are 34 caves in total, all man-made, and excavated from the vertical cliff face of the Charanandri hills. 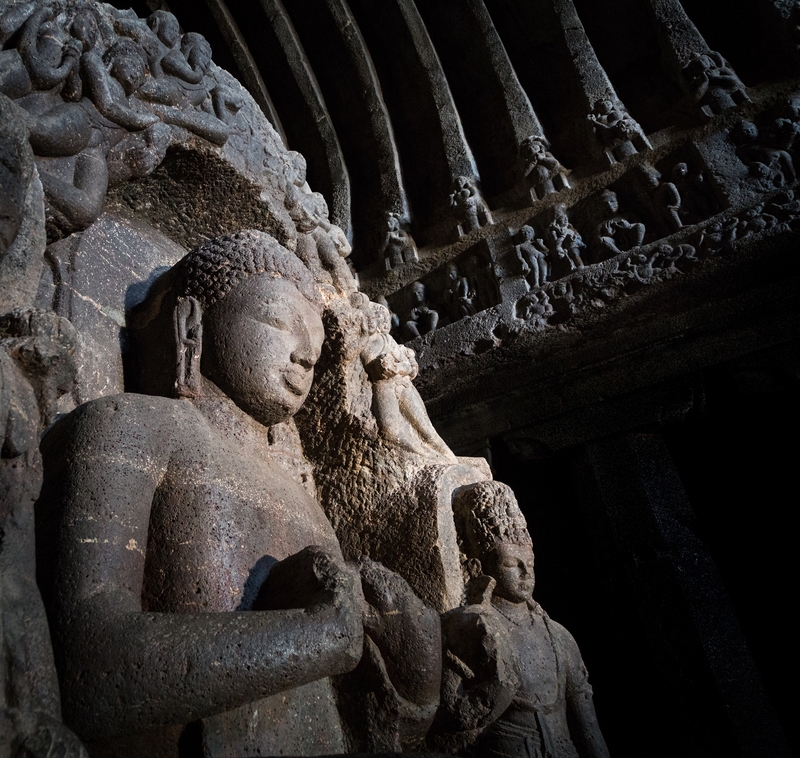 Ajanta was solely a Buddhist affair, but at Ellora we see caves from multiple religions, side by side in close proximity , and seemingly representing a degree of religious harmony during the period of their construction and use. 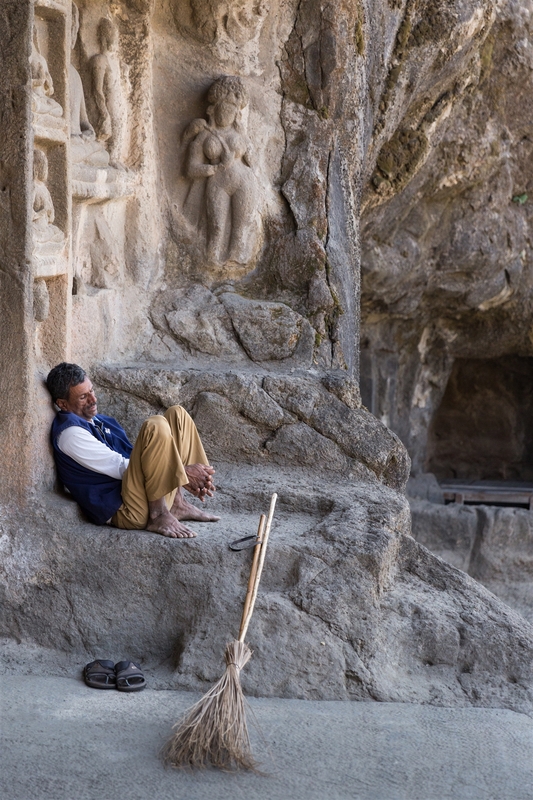 All the caves were built during the 5th-7th century A.D. 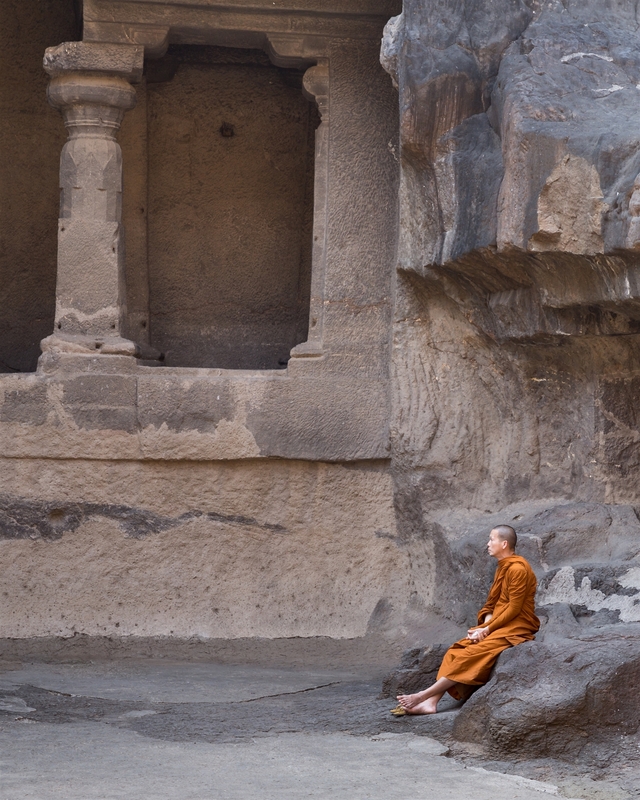 It is believed that the Hindu caves are the earliest, the Buddhist caves being the final additions. 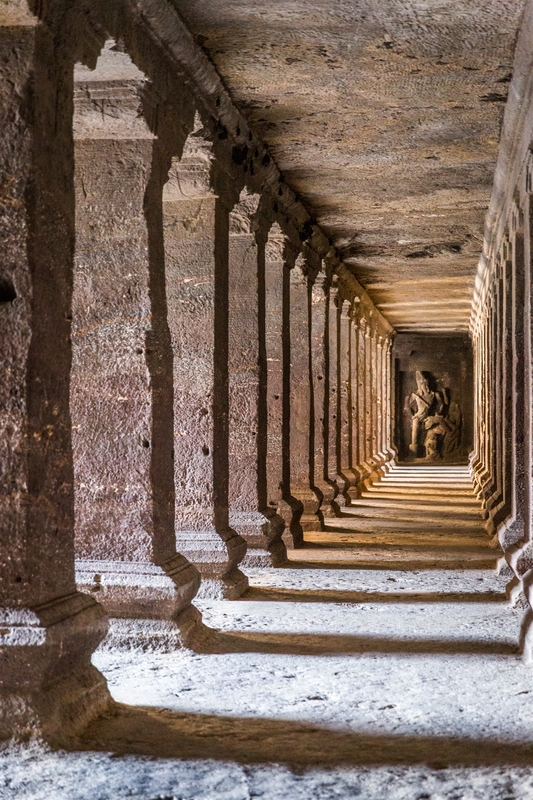 The star attraction of Ellora is undoubtedly Cave 16, it’s the first cave you come to having walked from the car park, and ironically isn’t actually a man made cave at all. 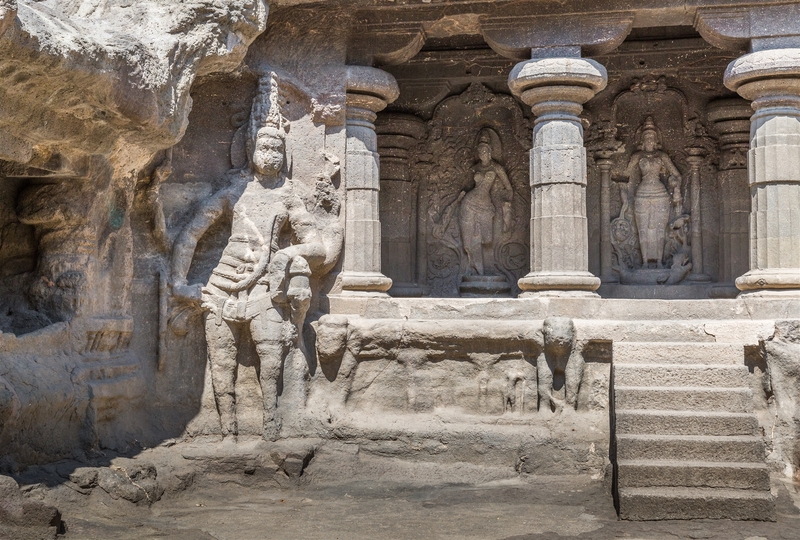 This is known as the Kailasa temple, and it’s simply stunning. It covers an areas double the size of the Parthenon in Athens, and yet most people outside of India have probably never heard of it. Over the last few years I have traveled extensively around India visiting places of historical interest and natural beauty. 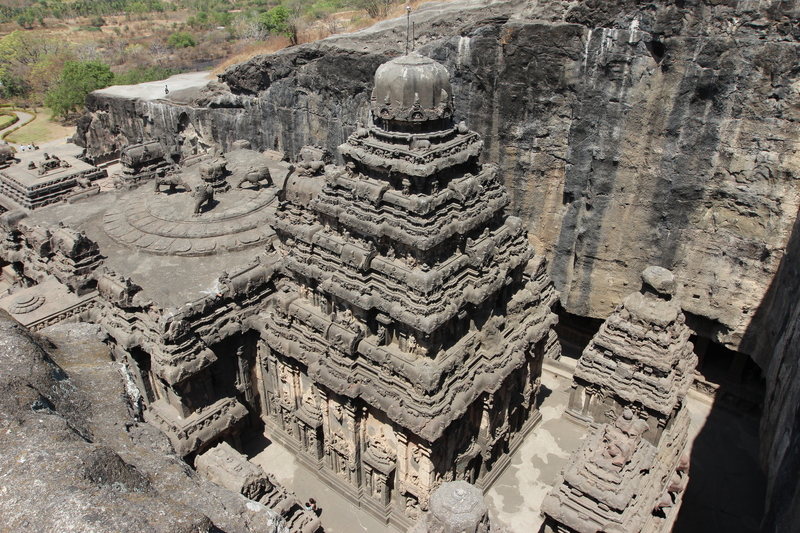 This is my third visit to Ellora and for me it’s very much a personal pilgrimage. 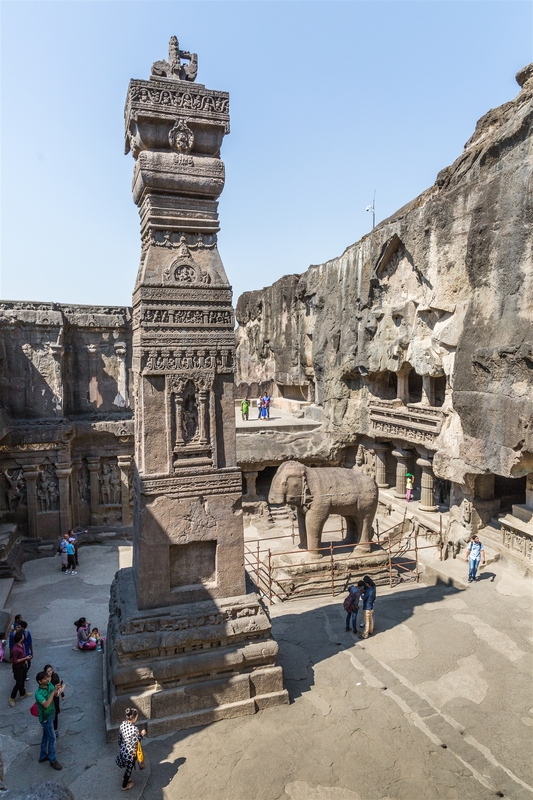 Ellora is quite unlike anywhere else I have ever visited, it feels like India’s best kept secret and yet here I am blogging it’s wonders to the planet :-). 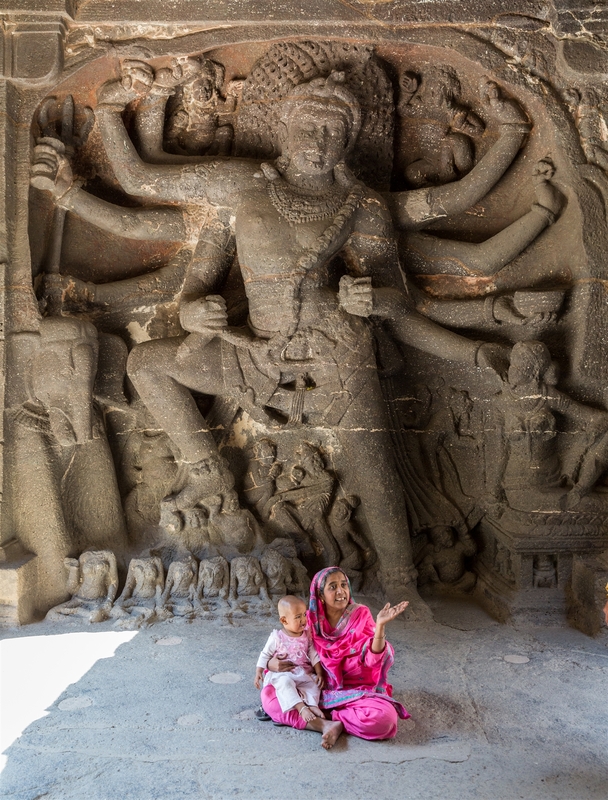 I could never grow tired of visiting Ellora, and on each visit your eyes are opened to something new – it is quite an extensive site and you should set aside the whole day to adequately explore it. Upon entering the temple complex pause for a moment to remind yourself that this seemingly free-standing multi-storied temple and associated structures are carved out of one single rock! 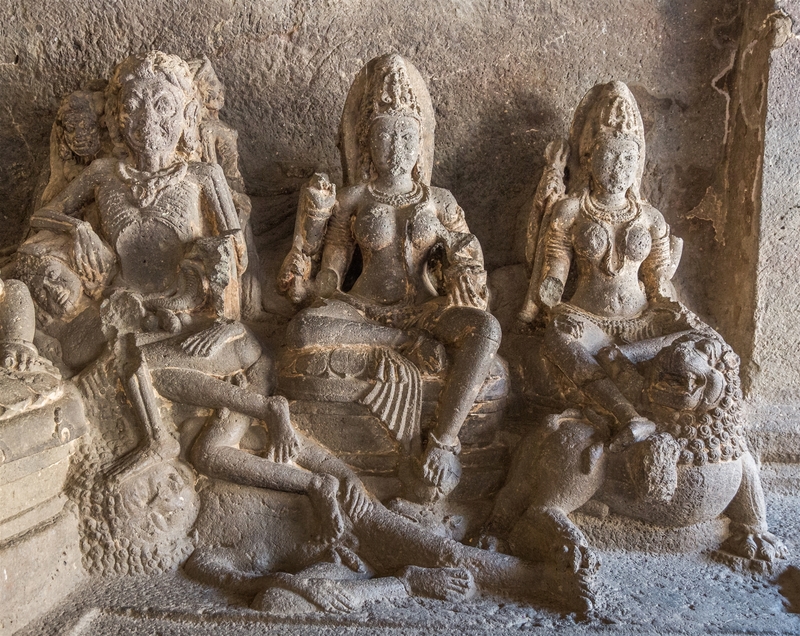 Of the 12 Buddhist caves at Ellora, the most famous and impressive is cave 10. 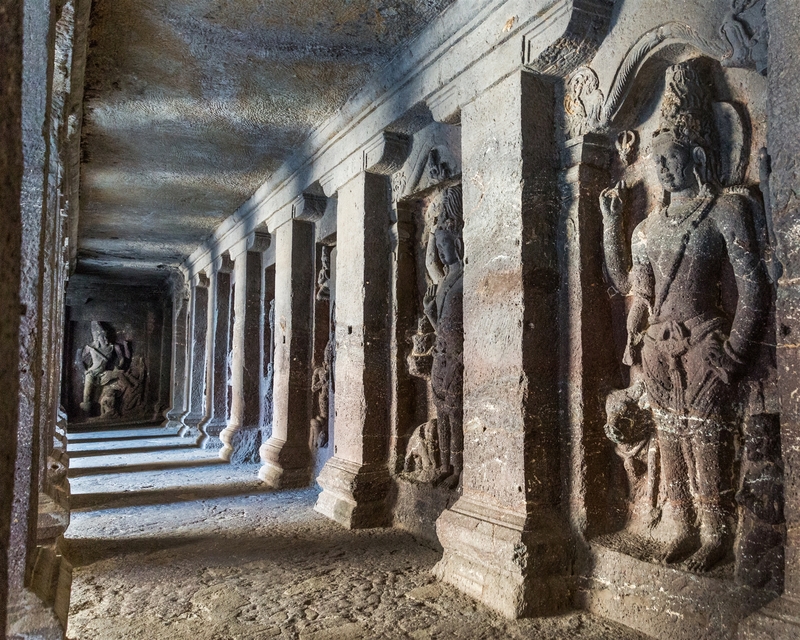 This is a chaitya hall, known as ‘Vishvakarma Cave’ or ‘Carpenters Cave’. At the far end of the hall is a large statue of Buddha sitting in his preaching pose, whilst towering above you is the cathedral like ceiling carved to give the impression of wooden beams. 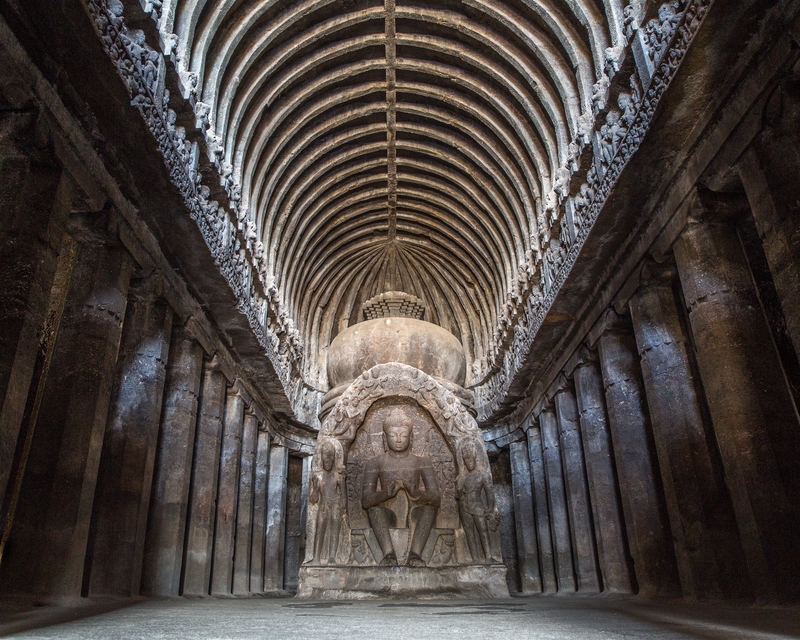 Every time I’ve visited cave 10 at Ellora there’s been an attendant at the entrance armed with a makeshift mirror, sending a beam of sunlight through the hall to cast a glow onto Buddha himself. He seems to spend most of his day doing this, and on occasions also heading into the cave to show off the impressive acoustics. If you have time at cave 10, there can be a treat that awaits you. When the number of visitors slows down considerably, as it seems to do around lunchtime, head up the stairs immediately outside the cave entrance to a second level balcony. Here you will find a locked wooden door, which if you are lucky will be opened by the attendant, now free from his mirror duties. The door leads to an internal balcony that overlooks the inside of the hall, and offers a unique view of Buddha down below and of course a chance admire the sheer effort involved in creating such a structure. All the time you have to keep reminding yourself that this was fashioned out of solid rock. Please give the attendant a few Rs for his services. 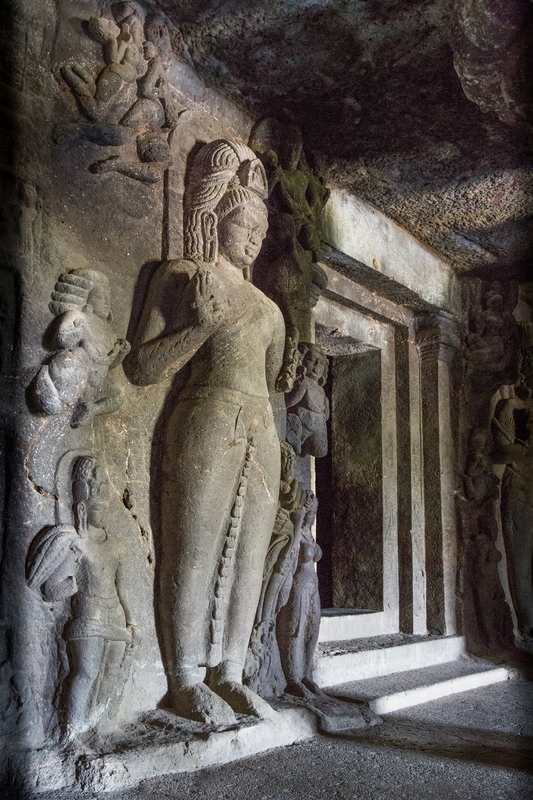 Most of the caves at Ellora consist of viharas, or monasteries. These are large multi-storeyed buildings with separate areas for living and sleeping, eating, kitchens etc. 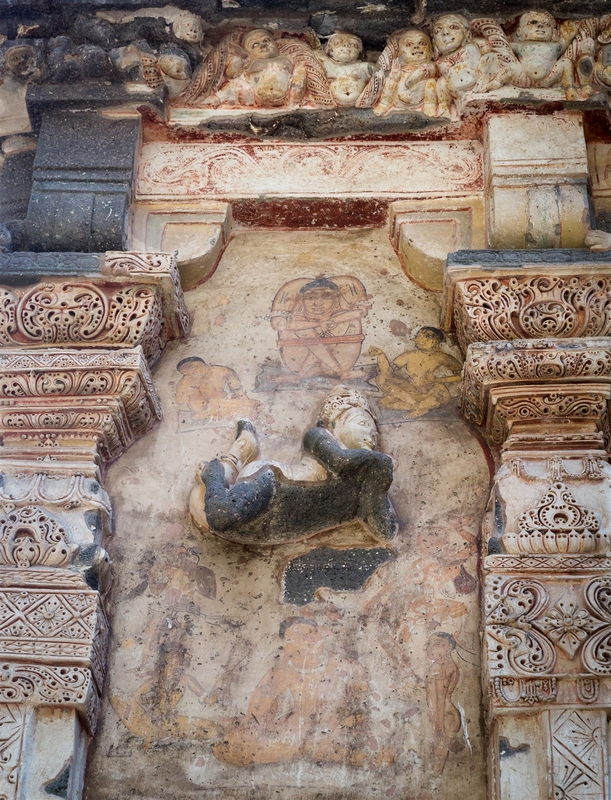 Many of these monasteries also include detailed carvings of saints, deities, and Buddha. 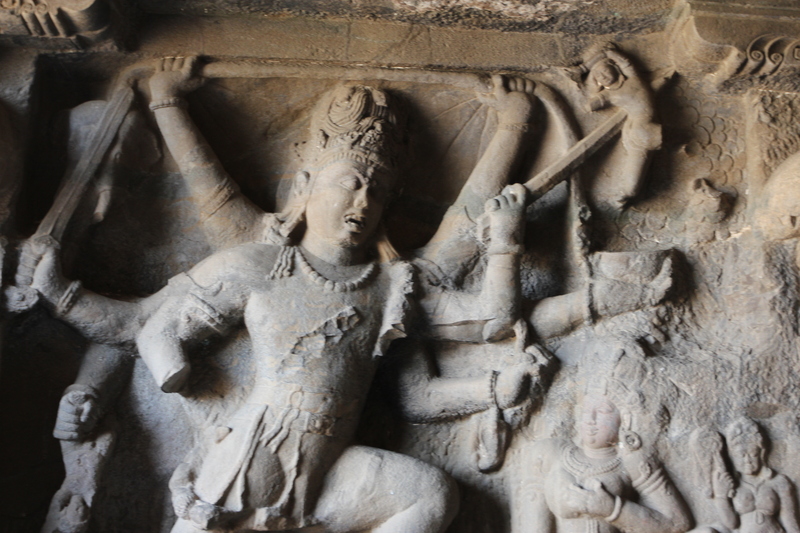 The Kailasa temple is designed to resemble Mount Kailash, the home of Lord Shiva, and once the temple would have been covered in white plaster to represent the snow on the mountain. 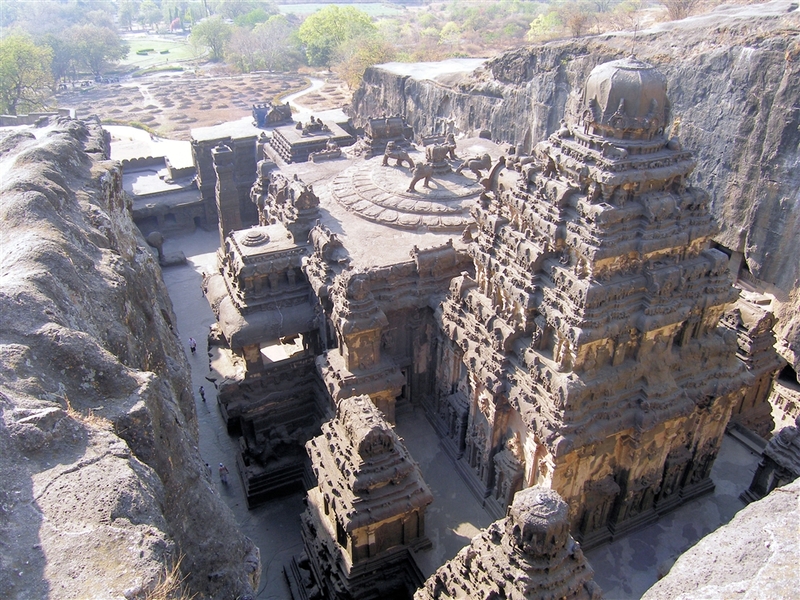 It has been estimated that to construct the Kailasa temple involved the removal of over 200,000 tonnes of rock, and took in excess of 100 years to complete. 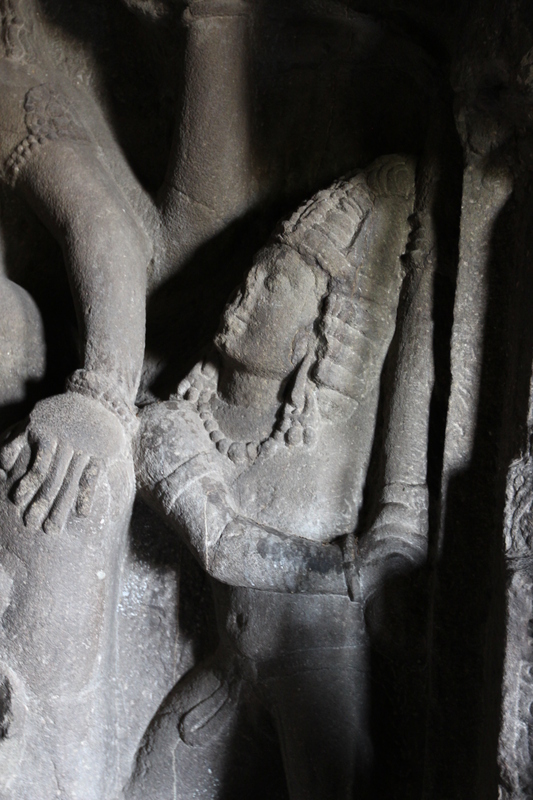 Ellora Caves are open 9am – sunset, closed on Tuesdays. Hi, can I use one of your photo for my digital manipulation artwork? Yes you may, so long as the source material is credited. Thanks. I love your FB group, keep up the great work you’re doing ! !